Yo, ho, ho, and a bottle of rum. Ahoy there me lads and lasses! It’s me again yer favorite buccaneer from the good old Jolly Roger! It was rather a tiring but great day as me and the crew came across an island that seemed to have ancient civilization living there in the past. We found ruins of structures and cool artifacts that were all amazing! Tired as I may be, of course this bucko won’t take a rest until I write another app review for ye me hearties! Since we just stumbled a new island, I will tell ye about an app that is also about an island. It’s called Lost Island: Blast Adventure by Plarium Global Ltd. The graphics of the game is top-notch. You will fall in love with its beautiful environment that has a depth in color. As the title suggests, the game is set in an island. Since it is a lost island, it has ruins that need clean-up, which you will do as you progress in the game; further revealing its beauty. There’s the blue sea, lash trees, ponds, fountains, and other things that will eventually turn it into a paradise. There’s no single complaint when it comes the images that you will see on the game. Most match puzzle games would require you to achieve specific goals to move to the next level by matching at least three of the same tiles or objects. It works almost the same except that you can match a minimum of two of the same tiles. Moves are also limited, and so as the lives. 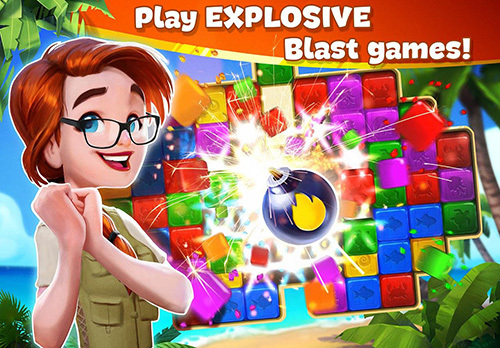 A huge difference between this game and most of the said apps from the same genre is that Lost Island: Blast Adventure also has a city building type of game on the side. There are missions that you need to do in order to turn the island to a beauty. Lives are needed to continue playing the puzzles. However, just like the other apps, you only have limited lives and it takes a long time before they are replenished. Stars are earned when you pass a level, but the number of stars you earn is only few. Every task in building the island requires a specific number of stars to do so you’ll run out of stars and lives in no time. This is the frustrating part of the game, especially if you want to continue playing but you don’t want to make an in-app purchase. Lost Island: Blast Adventure is free to download and it has an amazing graphics. 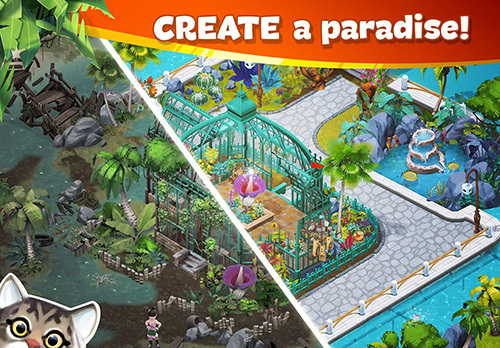 It has a variety as you are not just solving puzzles, but you are also rebuilding the island to show its natural beauty; and turning it into a paradise. It’s difficult to earn stars and lives, which can stop you from playing the game for some time even if you wish to continue, in case you run out of them. Lost Island: Blast Adventure is definitely an exciting and fun game. If only it was easier to earn lives and stars without making an in-app purchase, it would have been even better!